We’re Not in Kansas Anymore, Toto…. Uh-oh, I’m starting to get a little bad at keeping y’all updated here. Sometimes I’m just not sure what to write about. Other travel bloggers give advice and insight, and I don’t always feel like I have that. Others just talk about their journeys… but I always wonder if people really want to hear about everyday life. I started this blog to help me focus on the things I wanted to do… create, learn, and give. To connect with creative minds around the world, to learn about the world, and to give whatever I could, wherever I could. But my financial situation has been frustrating my attempts at this life. I have a lot of exciting ideas, things I want to do, and I pursue them no matter what, but sometimes I have to make sacrifices. Life doesn’t pause for you when you’d like it to! In the back of my mind, I keep thinking I should go live in Thailand where life is cheap, work online, and come back when I have savings. Instead, I’m back in France, and have been shutting myself in trying to make progress on some creative work and my online work. I’d been looking forward to this time for a while but now that I’m here, I’ve got singers-block or something! Actors-block… everything. I feel so unproductive. I’m still making efforts, but I can’t help but bounce around anxiously from one task to another and wonder what the point of everything is. You know sometimes when you have some big goals but you’re not sure where to start… you start by preoccupying yourself with little goals that make you feel busy? Well, I do. 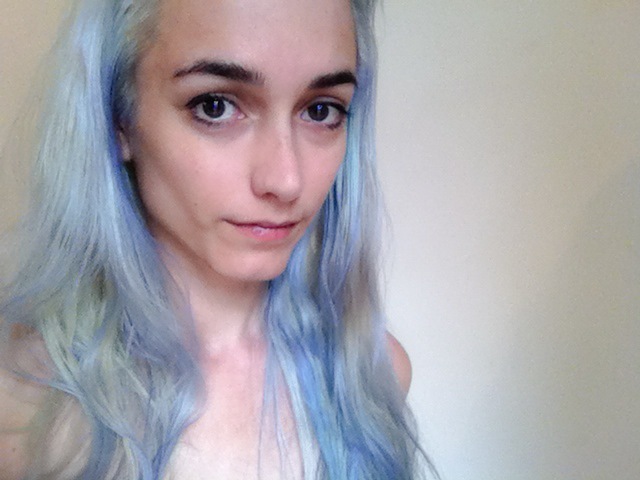 And the past two weeks I’ve preoccupied myself trying to find a specific product for the upkeep of my new hair color. Toner does not seem to exist in France. Here has been the process of trying to find it (and taking my mind off of the other more important things I should be doing). Or you can watch my video cry for help. 1. Locate salon supplies stores (something like Sally’s Beauty Supplies). 2. Visit one called Delorme, purchase blue bleach powder (so there’s no yellow, they tell me!) and developer. 3. Go to another salon supply store after bleaching my roots yellow, in search of toner. I get told I would have to bleach it more but I shouldn’t because it’s damaged. I keep trying to explain I won’t get it white by bleaching it more. 4. Go back to Delorme. Get sold some purple shampoo. 5. Go back to Delorme after the purple shampoo does nothing, and searching again on my own. Found a “blond toning” tube. Figured I’d try that. 6. Go back to Delorme after that doesn’t work and being told by a friend that I need to search for something called an eclaircessant. Salesperson returns with a small jar of purple stuff called “white toner.” OK. So you DO know the word “toner.” Now. 7. Throw up hands in disgust after this toner does nothing as well. 8. Happen to go into a Monoprix where they have a décoloration (whatever) in the hair dye section. Looks like she’s got white hair. I’ll try that. 9. Realize I’ve got a patch of spiky hair on the top of my head after this latest experiment, where I’ve melted my hair off. Clumps of hair like I’ve never seen clog my brush and the shower drain. 10. Brush my bangs back, put in more purple, and call it a day. Finally decide to order toner from the US. I don’t know how anybody dyes their hair here. I’m really loving the white and purple though. A real shame that I’ve hurt my hair so much in France trying to keep it up though. I’m slathering on the coconut oil and other hair products, and I think I’ll survive. And if you’d like a little slice of French life, I have a story for you (cleaned up from my Yelp review of a certain restaurant…). Now, don’t get me wrong, I’m not always a negative person. It was just out of the ordinary. There are plenty of good things about Paris and the people who live here! 🙂 But I feel obliged to warn people away from places that give bad customer service. I firmly believe in good customer service, and treating everyone kindly!! 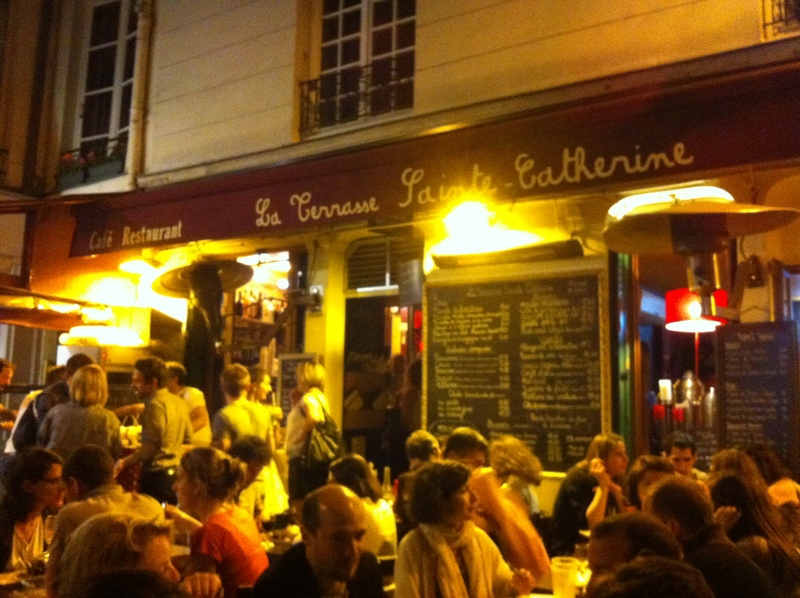 So two friends and I went out to enjoy the Fête de la Musique last Saturday evening, and around 11pm snagged a small table at this café from which we intended to order some drinks and fries and enjoy the music in the square. I wasn’t timing our server, but it took at least 15 minutes until we were noticed. That’s OK, we weren’t in a rush, and it was a busy night. When he arrived, he asked if we were eating or drinking, and refused to serve us if we were only drinking. We clarified that we were also getting some fries. This seemed acceptable. He laid out some napkins. He later came back to get our orders. Friend #1 ordered a drink and the 2 orders of fries. Friend #2 wanted a hot drink, but he said they couldn’t serve that, so she continued to look at the menu. I was dying for some water to kill an oncoming dehydration headache, so I asked for a carafe. He yanked away our menus and spouted off a stream of French at us to the effect that he wouldn’t serve us water. We were so shocked we barely knew how to reply, and he walked off. For the next 20 minutes or so he ignored us, except when debating with my friends (whose French is much better than mine), one of whom is familiar with the law (having been a lawyer) who told him it’s against the law to refuse water. In the midst of this debate, I watched him wipe snot from his mustache with his bare finger, and go on to hand plates to the table next to us. He got within inches of my friend’s face at one point as she sat in her chair, and she held up her hands telling him to back off. When friend #1 went to find the manager, he took her chair and folded it up, putting it to the side. Friend #2 promptly went to rescue it, and then took her turn at finding management. The owner of the restaurant brushed her aside several times, and another waitress appeared from behind the counter (at this point we were inside the restaurant, having given up the idea of staying there) to yell in my friend’s face. I was honestly concerned that she was going to get violent. My friend is a lovely, tiny girl, and for our massive server and this other waitress to get so physically threatening towards her was just shocking. So, after being refused service in this manner, around midnight we left. A whole hour had passed in which he could have served us and everyone would have been content. Our table was as good as empty for that hour. So I could not see the logic in refusing to serve us. And what is this place called? La Terrasse Sainte Catherine, in the Marais. You’ll know them by their servers wearing overalls. I would just say don’t go there. Let’s see, let’s see…. Well, I think this post is long enough for now. I’ll save something for next time! Though I have one more thing for you. I should have waited until I dyed my hair to do this one… But it just came to me one day while I was in LA, and I decided to record it right then and there! I’m really surprised I don’t have more views, Frozen parodies are just huuuuuuge right now! Share it if you like it. This is not the first time I’ve had to go to the Centre de Réception des Étrangers, but it was certainly the worst.